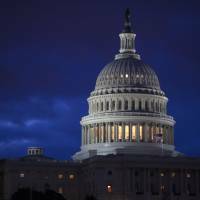 WASHINGTON - U.S. House and Senate negotiators reached a tentative bipartisan deal Sunday night on a $1.1 trillion bill that largely tracks with Democratic spending priorities and jettisons most of President Donald Trump’s top priorities, including money to begin building a wall along the U.S.-Mexican border. The deal, which would keep the government open through the end of September, was described by Republican and Democratic aides. GOP leaders eager to focus on health care and tax overhauls bowed to Democratic demands to eliminate hundreds of policy restrictions aimed at curbing regulations, leaving the Trump administration with few victories. The White House sought funding to begin building the border wall, as well as $18 billion in cuts to domestic agencies, and both demands were rebuffed. The spending deal includes money for Planned Parenthood, despite Republican demands to defund the group over its provision of abortions. Trump will be able to point to a $15 billion boost for the Pentagon, although $2.5 billion of that money is contingent on the administration delivering a new plan to fight Islamic State. Trump also will get $1.5 billion for border security, but it can’t be used for the border wall or additional Immigration and Customs Enforcement agents, according to a congressional aide. There are also no new restrictions on money going to so-called sanctuary cities that don’t fully enforce federal immigration laws. “Reports that the package makes a major down payment towards the president’s security priorities are encouraging,” John Czwartacki, a spokesman for the White House Office of Management and Budget, said in a statement. Republicans failed to get a provision in the bill that would have blocked the Labor Department’s fiduciary rule limiting financial advice to retirees. Overall, the compromise resembles more of an Obama administration-era budget than a Trump one. The National Institutes of Health, for example, would see a $2 billion boost, reflecting the popularity of medical research among lawmakers. The deal includes $990 million for famine aid, along with a $1.1 billion boost for disaster recover funds. The Environmental Protection Agency, which Trump has sought to shrink dramatically, would receive a 1 percent reduction in funding and no staff cuts, according to a senior congressional aide. The deal also includes steady or slight increases in funding for agencies within the Department of Energy, such the Office of Energy Efficiency and Renewable Energy, which would get a $17 million increase, and the Office of Science, which would get a boost of $42 million from fiscal 2016 funding levels, the aide said. The Advanced Research Projects Agency-Energy, which aims to fund experimental energy research and has been targeted for elimination by the Trump administration, would get a $15 million increase. The deal also includes a 2 percent increase for national parks, including nearly $40 million in new funding to address deferred maintenance and construction needs, according to the aide. The legislation would classify power produced by biomass, such as wood, as a carbon-neutral renewable energy source, a change back by groups such as the American Forest & Paper Association, a trade group that represents companies such as Deltic Timber Corp. and Resolute Forest Products, according to a senior congressional aide. Environmentalists have been opposed to the change. More than 70 anti-environmental policy riders in the bill were defeated, the aide said. The deal would provide a permanent, $1.3 billion extension of health-care benefits for coal miners. It would be offset by a boost in customs fees. The provision was backed by coal-state lawmakers in both chambers. The package would provide $68 million extra in local law enforcement funds to reimburse New York City and other localities for protecting Trump. House Minority Leader Nancy Pelosi also praised the deal. “The bill also increases funding for wildfire and federal highway emergency relief, and for Puerto Rico’s underfunded Medicaid program,” she said in a statement. Under the tentative deal, the island would get some relief with $295 million in unspent money for territories for a limited time, said a congressional aide. Democrats were pushing for an infusion of at least $600 million, so there could be more fights ahead. Under House procedures, if the text of the bill is released before midnight on Sunday, a vote could be held as early as Tuesday. 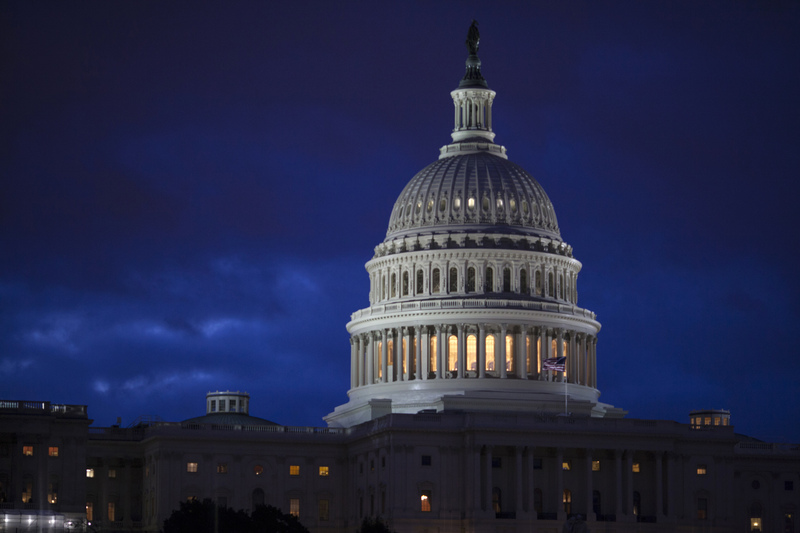 The bipartisan deal — reached by appropriators in both chambers in coordination with party leaders — would avert a government shutdown when a one-week stop-gap funding bill expires Friday. It would fund the government through Sept. 30, the end of the fiscal year. Agreement on the omnibus bill has been delayed by fights over a number of policy areas; Trump’s dropping of his demand last week for inclusion of money to begin work on wall along the U.S.-Mexico border was the most important breakthrough. While Republicans control the House, Senate and the White House, congressional Democrats held some leverage in the talks because their votes will be needed in the Senate, and likely the House, for passage of the bill. The Senate needs 60 votes to advance legislation, meaning the 52 Republicans will need help from at least eight Democrats. In the House, passing a spending bill for the remainder of fiscal 2017 was always going to be a challenge. A solid bloc of fiscal conservatives regularly oppose big spending bills, and House Republicans have had to rely on some Democratic votes consistently since taking over the majority in 2011. Sixteen House Republicans on Friday voted against the one-week extension of current spending that kept government open. The spending bill package would finish the job of appropriating agency spending seven months after the fiscal year began. The drawn-out fight could have been avoided in December had the incoming administration not instructed Congress to hold off on passing a bipartisan spending measure in order to give it a chance to weigh in. Beyond the border wall, obstacles to an agreement included White House resistance to demands from Democrats to guarantee the payment of billions in cost-sharing payments used under Obamacare to offset health-care premiums for low-income people. A stronger chance for a government shutdown could come in October. Trump has sought $54 billion in defense increases paired with $54 billion in domestic cuts. Republican leaders may be less willing to bow to Democrats without the excuse of being more than halfway through the fiscal year. Congress and the president will also need to agree on a debt ceiling increase in the fall, and White House budget director Mick Mulvaney has said he wants to use the debt ceiling to impose new spending restraints.